The Museum-Ed Discussion List is Museum-Ed’s most popular resource by far. Every month we recap the “Hot Topic” from the Discussion List for the Museum Education Monitor (MEM). If you don’t subscribe to the MEM, do consider it – it’s an invaluable resource on museum education research. Check it out HERE. We also thought readers of this blog might appreciate a summary of each month’s Hot Topic on the Discussion List, so here is May’s Hot Topic. 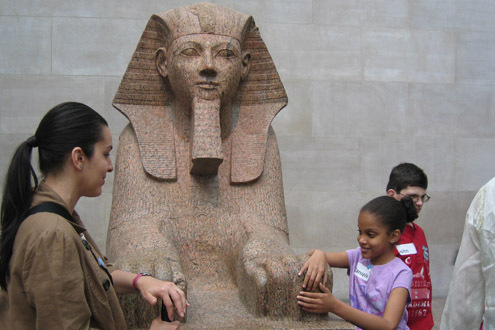 A student taking an In Touch with Ancient Egypt tour at the Metropolitan Museum of Art. Art Beyond Sight [http://www.artbeyondsight.org]: AEB’s mission is to make art, art history, and visual culture accessible to people who are blind or visually impaired. Our goal is to provide and promote the tangible benefits of art education, museum visits, and art making for children and adults with sight loss – to give those who cannot see equal access to the world’s visual culture and the opportunity to experience the life-enhancing power of art. VSA [http://www.vsafl.org]: VSA Florida (VSAFL) is a state affiliate of VSA, an affiliate of the John F. Kennedy Center for the Performing Arts. VSA arts was first known as Very Special Arts. The FL affiliate was begun in 1981 by the Florida Department of Education and the Florida Department of State and was housed at FSU. The state office moved to USF, Tampa in 1996. VSAFL now offers programs/activities for all 67 FL counties. VSAFL provides programs in: cultural access, services for adult artists with disabilities, outreach and exhibitions, professional development, community programs, and artists in residence. Dialogue in the Dark Project [http://www.dialogue-in-the-dark.com/]: The concept of Dialogue in the Dark is simple: visitors are lead by blind guides in groups through specially constructed dark rooms in which scent, sound, wind, temperature and texture convey the characteristics of daily environments – for example a park, a city, a boat cruise or a bar. The daily routines become a new experience. A reversal of roles is created: people who can see are taken out of their familiar environment. Blind people provide them with security and a sense of orientation by transmitting to them a world without pictures. The tour itself lasts for about one hour but the effects can last a lifetime. Metropolitan Museum of Art [http://www.metmuseum.org/events/programs/programs-for-visitors-with-disabilities/visitors-who-are-blind-or-partially-sighted]: The Met leads many tours for visitors who are blind or partially sighted. Many of the principles found for training docents to lead these tours may be helpful in training partially sighted docents.